A liquid organic fertilizer specifically designed for use on turf grass. Turf Formula Turf Formula is an environmentally-friendly fertilizer containing the perfect blend of nutrients for all your turf and soil needs. This product is a storehouse of over 60 major and minor chelated nutrients plus amino acids. Turf Formula can be used on all grass types and all turf situations, as well as for landscaping to treat all plants, trees and shrubs. 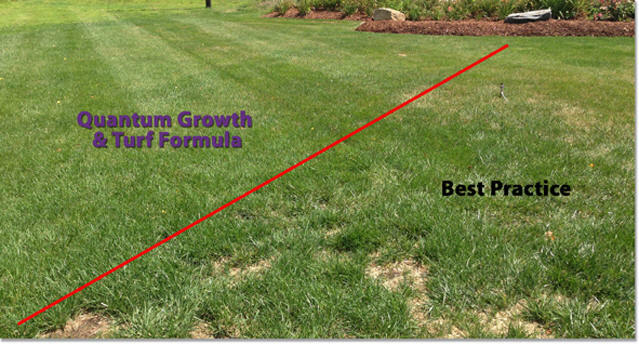 Turf Formula increases nutrient efficiency, helps soils retain water, builds root mass and organic matter and stimulates beneficial microbial activity. All this while decreasing the costs of other inputs such as nitrogen and phosphorous-based fertilizers and pesticides. Try our Complete Lawn Starter Pack for a great deal on this product and to combine this fertilizer with Microbe Life probiotics!